"We each commit our city to take all available steps to ensure the internet remains open and to keep gatekeepers from throttling, blocking, or limiting government content," says the pledge. In direct response to the Federal Communication Commission’s (FCC) December voteto repeal net neutrality protections, more than 100 mayors nationwide have now signed a pledge vowing to defend the open internet at the local level. “If bureaucrats in Washington, D.C., won’t protect net neutrality against the FCC’s wrongheaded decision, local leaders are ready to step up for the people they represent,” declared Timothy Karr of the Free Press Action Fund, which partnered with a coalition of groups to create MayorsForNetNeutrality.org and enable residents to encourage their majors to sign the pledge. 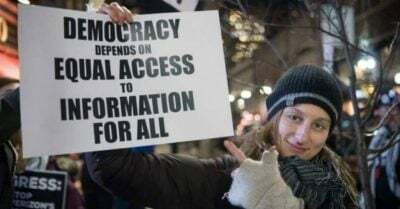 While city and state leaders increasingly use their platforms to defend the open internet, advocates and congressional Democrats are working to pass a Congressional Review Act (CRA) resolution to overturn the FCC’s repeal.